1765-1822. Of French Huguenot ancestry, he was baptised on 16 November 1765 in London, one of two sons and three daughters of John and Esther Puget. His father, a banker and merchant, died two years after his birth, and his mother appears to have remarried, as Puget was later described as the ‘son of Esther Hey of Wingham’, a village in Kent. Puget entered the Navy on 1 August 1778 aboard the Plymouth-based Dunkirk 60, Captain John Milligan, before joining the Siren 24, Captain Edmund Dod, on 12 December 1779, being employed in the North Sea. On 13 June 1780 he transferred with Dod to the Lizard 28, going out to the Leeward Islands in the following spring and being present at the Battle of Fort Royal on 29 April 1781. The frigate was later under the orders of Rear-Admiral Sir Samuel Hood at the Battle of St. Kitts on 25/26 January 1782, on which island Puget saw service ashore with a force of naval gunners, and he was subsequently a witness to the Battle of the Saintes on 12 April. After returning home the Lizard was paid off in September at Deptford, and on 16 November Puget joined the Thetis 38, Captain John Blankett, which frigate went out to Gibraltar in the spring of 1783 before returning home to be paid off in May. Almost immediately Puget joined the Europa 50, Captain Hon. Michael De Courcy, the flagship of Vice-Admiral James Gambier for the Jamaican station, which under the captaincy of Edward Tyrrell Smith and Richard Fisher flew the flag of Rear-Admiral Alexander Innes on the same station from 1784, and then under Captain James Vashon flew the broad pennant of Commodore Alan Gardner from 1786. He returned home in July 1787 and after several months ashore rejoined Captain Dod aboard the frigate Lowestoft 32 in May 1778, serving in the Channel for a short while. From November 1788 until June 1790 he was a midshipman aboard the Indiaman Prince, going out to the East Indies. In June 1790 Puget joined the Discovery, Captain Henry Roberts, and remaining with this vessel through the Spanish Armament at Deptford he was commissioned lieutenant on 15 November, by which time she had been placed under the command of an old shipmate from the Europa, George Vancouver. He played a prominent part in that officer’s voyage of exploration to the Pacific which departed England in April 1791, and Puget Sound was discovered and named after him in May 1792. He later succeeded to the command of the Discovery’s consort, the Chatham, when Lieutenant William Broughton was sent home in January 1793 to seek clarification of issues regarding the dispute over Nookta Sound. The Chatham eventually arrived home on 17 October 1795 with Puget delivering despatches to the Admiralty from Vice-Admiral Sir George Keith Elphinstone at the Cape, and he was promoted commander that month. In February 1796 he was appointed to the transport Adelphi in which he went out to Gibraltar with stores, remaining with her until September. At the end of the year he set off for home with despatches aboard the Whitehaven merchantmen Esther, on board of which were ninety-two invalided soldiers in addition to women and children. During the voyage the Esther captured a Spanish merchantman, the Conde de Galves, in passage from the River Plate for Cadiz with a valuable cargo, however on 30 December the French frigate Bellona 32, which had been with the French expedition to Ireland, captured the Esther. Finding her to be of little value, but deciding not to scuttle her in view of the number of vulnerable passengers aboard, the French returned the Esther to her crew after relieving them of any valuable possessions. Before the capture Puget had managed to throw the despatches overboard, and the Esther arrived at Plymouth on 2 January 1797. Puget next went out to join the Mediterranean Fleet off Lisbon aboard the Theseus 74, Captain John Aylmer, and he briefly held the command of the sloop Raven 18 in succession to Captain William Prowse before being posted captain on 29 April 1797 and placed in command of the captured Spanish San Nicholas 84, whose crew he delivered to Lisbon. He subsequently arrived at the Admiralty on 8 July with Admiral the Earl of St. Vincent’s despatches, amongst which was the report that the Raven, commanded by his successor, Captain Bartholomew James, had taken a Spanish galleon valued at 300,000 guineas. In 1798 Puget had the troopship Tromp, seeing service on the Irish station, and upon leaving her he commissioned the recently-launched Téméraire 98 at Chatham on 28 March 1799 as the intended flag-captain to Rear-Admiral James Hawkins Whitshed, who had gone out to the Mediterranean aboard the Queen Charlotte 110, Captain John Irwin, following the breakout of the Brest fleet on 25 April. From June he flew the flag of Whitshed aboard the Barfleur 98 in the Channel whilst Captain Thomas Eyles continued to fit out the Téméraire 98 in a temporary capacity. Both Puget and Whitshed then removed to the Téméraire in October to serve in the Channel, and Puget left her in the following April. After a period on the beach Puget commanded the Monarch 74 from March 1801 with the flag of Rear-Admiral Sir Thomas Graves on the Yarmouth station, and this vessel arrived at Chatham to be paid off at the end of April 1802. Puget was not immediately re-employed on the resumption of war with France in 1803, but from February 1804 he had the Foudroyant 80 in the Channel fleet as the flag captain to Rear-Admiral Graves, coming in to Plymouth in early April for a refit and fumigation to contain a fever that was passing through the ship. The Foudroyant was back at Plymouth again at the end of June, but in late October, whilst she was off Start Point, Devon, Puget fell down the poop ladder to the lower gun-deck and was knocked out cold. At first there were fears for his life, but with many cuts and bruises to his head he was carried ashore at Plymouth to convalesce, whereupon Captain Christopher Nesham assumed the acting-captaincy of the Foudroyant. In early January 1805 Puget was appointed the agent for prisoners, and it was hoped that he would be allowed to travel to France to conclude an agreement to re-impose the traditional exchange system. Regrettably, Napoleon soon made it evident that he was not interested in such a proposal, and although Puget’s application for passports was refused he only left the position of agent of transports in June, by which time he had rejoined the Foudroyant with Graves’ flag, serving off Rochefort. In July Graves was superseded on that station by Rear-Admiral Charles Stirling and the Foudroyant returned to the Channel fleet where she was present in the partial engagement with the Brest fleet on 22 August. On 18 September the Foudroyant arrived at Plymouth, whereupon Puget left her. From December 1806 Puget briefly held the command of the Prince 98, and having re-commissioned the Goliath 74 in February 1807 he joined Admiral Lord Gambier’s expedition to the Baltic. 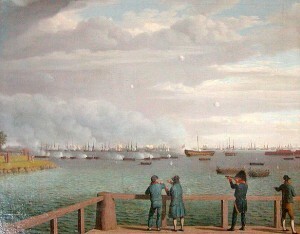 On 22 August he commanded a flotilla which was charged with protecting the army by blocking the advance of three 20-gun Danish praams, and in consequence became engaged with the famous Trekroner Battery at Copenhagen on the following day. 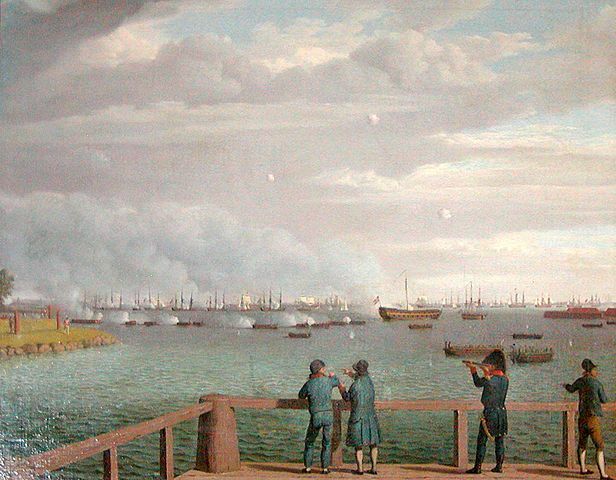 He was then present at the bombardment of the Danish capital on 7 September. During the early months of 1808 Puget commanded the squadron at the blockade of the Texel, and in the summer the Goliath was attached to Vice-Admiral Sir James Saumarez’ Baltic fleet before returning to Chatham and being laid up in November. From July 1809 he was the commissioner for the Navy, Victaulling and Transport Boards in the Schelde expedition, and he enjoyed the title of Naval Commissioner at Flushing until the evacuation in December. As a result of the expedition’s failure he was required to give evidence to the subsequent committee of enquiry in the spring of 1810. In May 1810 Puget was appointed the naval commissioner in India based at Madras, and in fulfilling those duties he also oversaw the construction of the new naval base at Trincomale. Leaving this post in February 1817, he and his family took passage home aboard the Horatio 38, Captain William Dillon, living ashore at the latter’s expense at the Cape for three weeks, taking over his cabin, and even duping him into paying for a farewell dinner. Eventually Dillon got the money back, but he did not receive the parliamentary influence to further his career which had been promised by Puget, nor the costs incurred by Mrs Puget’s female companion. To compound matters, when the Horatio got back to Portsmouth Mrs Puget assured Dillon that a number of her trunks contained only linen, whereas they in fact contained Indian products on which customs were due, and which were discovered by the customs officials to Dillon’s great discomfort. Captain Puget did not see any further service and he retired to Bath for the benefit of a constitution that had greatly deteriorated in India. He was nominated a C.B. in August 1819 to rectify the mistake of an earlier omission, and was promoted rear-admiral on 19 July 1821. Puget died at his residence of 21 Grosvenor Place, Bath on 31 October 1822 after a long and painful illness. He was buried in the churchyard at Woolley near Bath. On 6 February 1797 at Old Church, St. Pancras, London, he married Hannah Elrington, the daughter of Captain William Elrington of the Army, with whom he had seven sons and four daughters, and who outlived her husband by twenty-eight years. His son, William David Puget, entered the navy in the East Indies whilst Puget was employed there as the commissioner, and retired as a captain. From the turn of the 19th century Puget and his family lived at Presteigne, Radnorshire, and he was a great friend of Captain Joseph Baker who had been his junior lieutenant in Vancouver’s voyage and lived nearby. Described variously as an officer of ‘audacious recklessness’, as ‘active and enterprising’ and ‘active and zealous’, he planned an assault on the Brest fleet using fireships, but this was never carried out. 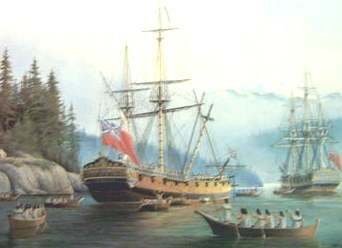 Following the death of Captain Vancouver in May 1798 Puget and Vancouver’s brother John ensured the publication of the explorer’s account of his voyage.